For my lunch/Dinner post today i am posting one of my favorites! “the zucchini Dish” as I call it!!! 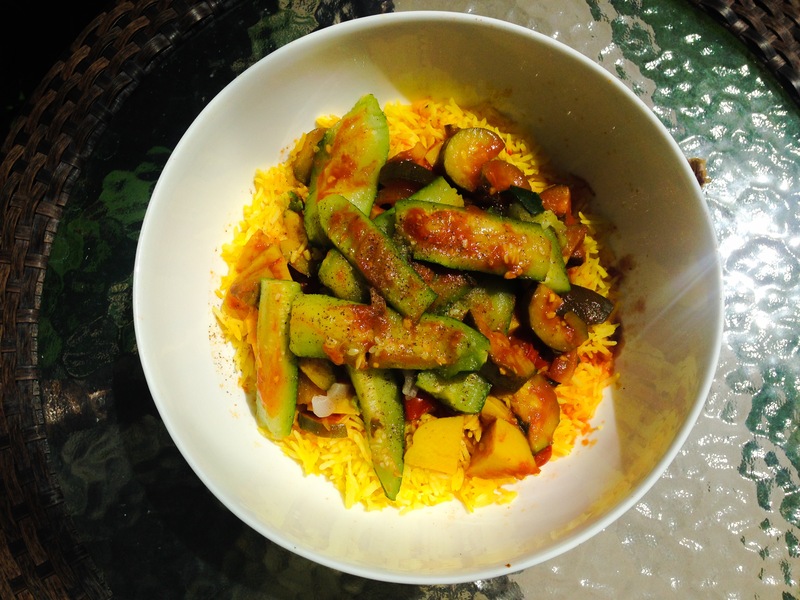 this dish is adapted from a Persian dish that I grew up eating and loving… its been Veganized as the crazy kids say… haha!!! ** i do not cook with oil or salt in my recipes in Keepings with my HCLF lifestyle. – A pinch of pepper. *Note: Zucchini is extremely low in calories, but it gives you the feeling of being full. As an outstanding source of manganese and vitamin C, zucchini is the best source of dietary fiber that will keep your body in the best shape for the long run. It also contains vitamin A, magnesium, folate, potassium, copper, and phosphorus . This summer squash also has a high content of omega-3 fatty acids, zinc, niacin, and protein. Moreover, vitamin B1, vitamin B6, vitamin B2, and calcium in zucchini assure optimal health. _ Chop your veggies, potatoes and the Zucchini.. I cook mine with the skin and chop it in in big chunks 🙂 you can do as you please. – Add the mushrooms and the turmeric and let it cook for 2-3 minutes.. this will in fuse the flavors. keep stirring. – Add in Half a cup of hot water and let it continue to boil. – After boiling… bring to a simmer and add in the tomato paste and stir. _ Add in the Potatoes & Zucchini & Cover and cook for 10 minutes. *I do not cook with salt but you can add salt if you like! or Use lemon instead. ***I serve this with a side of salad with my Secret low fat/ no oil salad dressing. & some Green onion sprouts. I hope you like this recipe! it is a very healthy and fulfilling dinner! and delicious! This looks really good. I’m curious: have you always omitted salt/oil in your cooking or something that you transitioned to later in life? Just wondering if you had to retrain your taste buds and if so, how you did it 🙂 Your recipes look really delicious and nourishing. I think I’m going to have to try your water and simmer trick tomorrow in my veggie breakfast…hmmm? yum! Trader Joes sells both….I will never go back to white rice…love the flavor of the brown…I also love wild rice too…. I don’t digest brown rice as well as the white rice.. also I am from a culture where white rice is a must 😉 I had read that brown rice is full of phytates and lectins, which bind to vitamins and minerals and prevent them from being absorbed.